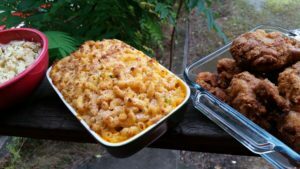 Hello Loves, I am so glad I get to share my favorite Mac & Cheese recipe of mine. I hope you enjoy. Bring water to boil, add pasta and cook until al dente. Microwave or boil milk for 1 1/2 mins. In the meantime add butter in a large pot over medium-low heat and whisk in flour, constant whisking to avoid clumps until mixture is smooth. Add warm milk and continue to whisk for 5mins until roux is thick. Add to the mixture salt, pepper, dried thyme, onion and Cajun powder, stir and then add shredded cheese until creamy. Grease your container you wish to use. Add mixture to the bowl/tin and top with extra cheese. Melt butter in a skillet and toss bread crumbs to coat. Top macaroni with the bread crumbs.